Samsung created the CSR (Corporate Social Responsibility) Liaison Office, comprised of a team of executives to address and resolve social issues around the globe. It’s a natural part of being involved in and helping to foster all the communities where we do business. Samsung Electronics introduced the world’s first LED TV, bringing a new level of picture quality to home viewing. It’s another example of how our innovation goes beyond incremental improvement to reinvention. Samsung Electronics kicked off the New Year with the world’s first 3D HD LED TV. Avatar director and 3D pioneer James Cameron was on hand, along with the Black Eyed Peas, to help us introduce a Times Square audience to the future of home entertainment. Samsung Electronics solved the age-old self-portrait problem by introducing the first camera ever with an LCD screen on the front. Expect to see a world-wide improvement in profile pictures. Samsung Electronics made the decision to invest $20 billion in research and development of solar panels, electric cars, LED and other environmentally responsible businesses. This push for diversification reflects the company’s belief that environmental consciousness will be crucial to good business for decades to come. Samsung Electronics introduced the GALAXY S, a smartphone enabling HD video with the fastest graphics processing unit to date. Most importantly, the GALAXY S allowed millions of people around the world to access the benefits of this technology for the first time ever. Samsung Electronics announced the release of the most powerful smartphone in its era, the Galaxy SII. More and more people around the world now use Samsung Electronics smartphones. The company’s unique ability to innovate and then to make those innovations available to everyone, everywhere is how we change the world through technology. Samsung Electronics introduced the world’s first large-screen OLED TV ready for mass production (ES9500), spanning 55-inches in screen size. The Samsung ES9500 OLED TV features unprecedented picture quality, a wide range of Smart Content, and premium design—marking a new era in history for Samsung and the TV industry. Samsung Electronics introduced the second generation of the Samsung Notebook Series 9 at the International Consumer Electronics Show (CES) in Las Vegas. 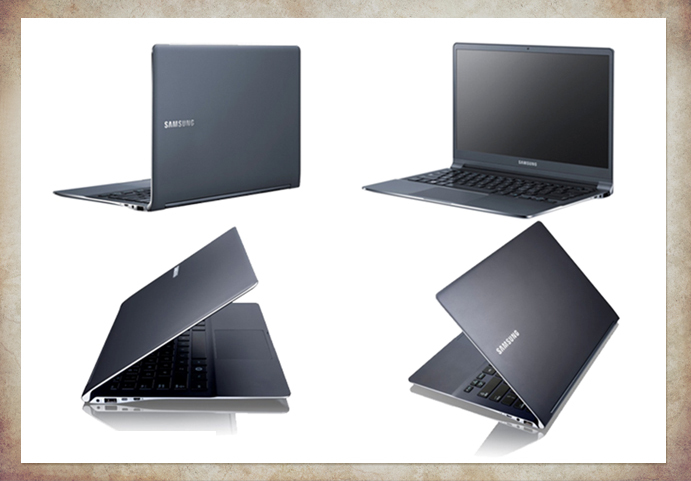 Following the former model’s premier at the CES 2011, the new Series 9 represents Samsung’s advanced innovative craftsmanship in the premium notebook sector. Samsung Electronics introduced the mobile semiconductor, “Exynos” (a combination of the Greek words Exypnos and Prasinos, meaning smart and green, respectively) which powers the incredibly popular Galaxy S Series. Breakthroughs in core technology led directly, and quickly, to tangible improvement in consumer technology. Effortlessly smart and intuitively simple, the newest Samsung Electronics Galaxy represents the company’s commitment to quality and innovation. Nicknamed “the human phone” because of its uncanny ability to sense and respond to its user, the S III brings revolutionary new thinking to the connection between people and their devices. the GALAXY Camera combines high performance photography with the latest Android OS 4.1, so called Jelly Bean, and 3G, 4G and Wi-Fi-only connectivity, creating a brand new type of device for those who wish to shoot, edit and share high quality photographs and video easily and spontaneously from anywhere, at any time. Samsung introduced the GALAXY Note II, a whole new level of innovation for the GALAXY Note category. The new Samsung GALAXY Note II enables unique experiences in personalized and expressive content creation, making it the ultimate smartphone for on-the-go creativity. Samsung Electronics announced its brand-new ATIV devices based on Windows 8 and Windows Phone 8 platform for smart PCs, tablets and smartphones. With the introduction of Microsoft’s Windows 8 operating system, Samsung introduces “ATIV”, the new brand for its Windows-based devices. 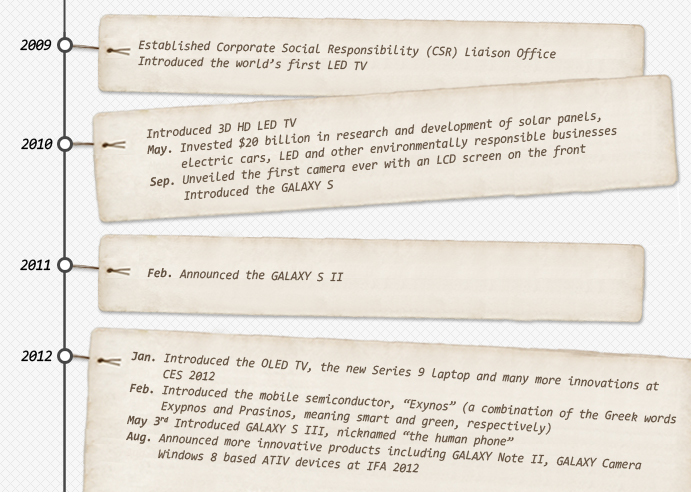 ATIV, the reverse order of VITA meaning “Life” in Latin, is a pledge by Samsung to make everyone’s life easier. The full range of Windows 8 powered devices will enable this goal. 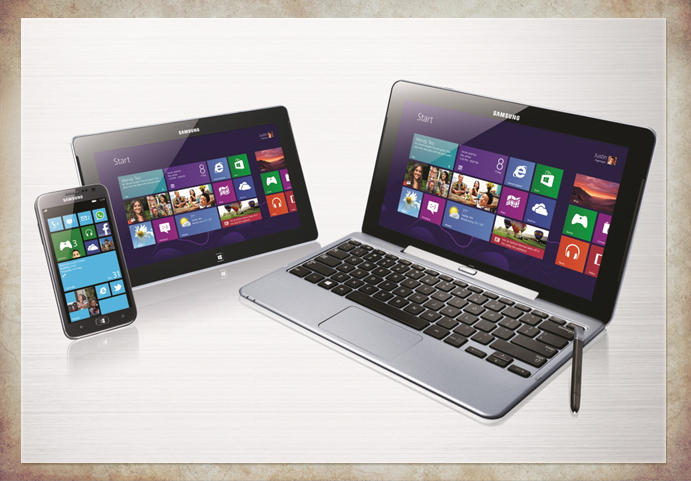 Samsung launched ATIV Smart PC, ATIV Smart PC Pro, ATIV Tab, and ATIV S, offering a full range of ATIV devices. We’d like to thank all of our readers who’ve made it through all 24 episodes of history from 1969 to 2012, including our latest History of Samsung episode. Even for the authors of these posts, it has been impressive to see the progress that has been made in the past few decades, as it was not so long ago that a phone was just a phone. While the technology to post our timeline may have only truly developed in recent years, we wouldn’t be anywhere without our history. We hope this helps you better understand how Samsung has developed, how Samsung products have developed, and how technology and business have changed and innovated. We now cross the line into the future, and we hope to keep your interest with our changing and cutting edge product line-up. Thank you again!